Ethan Watrall, Assistant Professor, Department of Anthropology, and Associate Director, MATRIX, gets the Institute rolling with an introductory talk. The Institute on Digital Archaeology Method and Practice is collaboration between the Michigan State Department of Anthropology and MATRIX, funded by a $250,000 grant from the National Endowment for the Humanities. The Institute was created as a solution to problems within the digital archaeology field, including, but not limited to, the world of archaeology cutting itself off from digital practice, the exclusion of non-archaeology scholars from discussion, and a disconnect in archaeological practice between anthropological and humanist archaeologists. Because of these issues, the Institute hopes to accomplish several goals: build capacity traditional and nontraditional archaeology scholars; bring methods and practices from the digital humanities into archaeology; build a unified digital archaeology community; have anthropological and humanist archaeologists collaborate to solve issues of digital archaeology; introduce digital archaeology practices to non-archaeology scholars; and create a dialogue of digital practice within the archaeology field. The Institute invited archaeologists from public and private sectors, museums, and universities, as well as graduate students, to participate in the six-day event. The first meeting of the Institute on August 17-22, 2015, welcomed 28 attendees to the Lab for the Education and Advancement in Digital Research (LEADR) in Old Horticulture Hall at MSU. 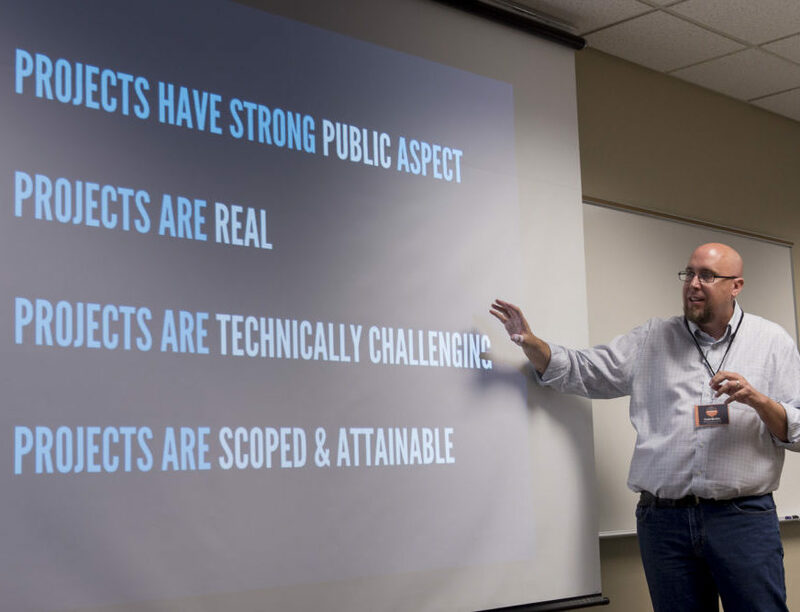 Attendees took in lectures and workshops designed to give them hands on experience with “nontraditional” technologies used in digital archaeology. Themes of the Institute included geospatial and cultural mapping, 3D and augmented reality, and public outreach and engagement, among others. But most importantly, attendees practiced project development and management with their capstone projects. Throughout the Institute, attendees were asked to develop a digital archaeology capstone project, which they presented to experts and other attendees in order to refine their ideas. For many attendees, this was the first time they had developed, designed, and launched their own digital archaeology project. In August of 2016, attendees gathered again at Michigan State University for another round of the Institute. Between the two sessions, attendees worked on their capstone projects and had the opportunity to call on their mentors from the program for any help that they need. During this period, they also were asked to post regular updates to the institute’s website and participate in web-based seminars put on by the institute. At the 2016 gathering, the main focus was on the attendees' personal projects. Related discussions and workshops included data preservation, sustaining digital archaeology projects, and advanced project management for digital archaeology. Ethan Watrall and Lynne Goldstein serve as the Institute Directors and Principal Investigators. Other faculty include Terry Peterkin Brock, Kathleen Fitzpatrick, Catherine Foley, Brian Geyer, Shawn Graham, Eric Kansa, Daniel Pett, and Christine Szuter. To see capstone project updates from attendees or to learn more about the institute, visit http://digitalarchaeology.msu.edu.